With the additional food for dogs dog fit by PreThis® joints with glucosamine and chondroitin & MSM allow your pet for an optimal mobility entirely without burdensome joint problems into old age! 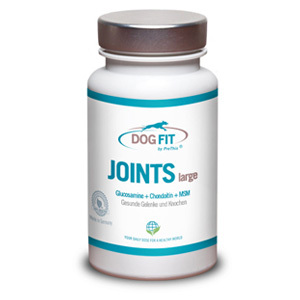 This includes this special dog food for the three important joint nutrients glucosamine, chondroitin and MSM in a particularly high dosage and in certified quality. Using the important joint nutrients glucosamine, chondroitin and MSM, dog owners with the help of premium product DOG FIT by PreThis® JOINTS with a high-quality prevents and protects against the degeneration of the joints to a painful arthrosis. You will also receive an effective means for the treatment of osteoarthritis or resulting ArthRistis. How can joint problems arise? On the one hand they are due to race, but also as a result of an unbalanced diet, overload, or but also through the natural aging process of the dogs, the concentration of nutrients in the joint cartilage ground reduce what an enormous risk to the joint cartilage and also for the joints itself. Because has a joint wear only once set, so the effect of the various loads are not buffered on the joints of animals and cause damage sooner or later, with enormous pain and even with reinforcements can go hand in hand – a Osteoarthritis results! How can I prevent joint problems? The joints of the dogs always need a regular supply with these three important nutrients in out-reaching concentration and composition, so that the ground is not back cartilage and also the forms for the protection function of the articular cartilage indispensable flexibility and flexibility of the cartilage cells. In acute cases, DOG FIT by PreThis® JOINTS for strengthened joint cartilage, more fluid and gel modified inflammation. Thus, the product may be ideal for the treatment of joint pain can be used and a rapid pain relief in place. DOG FIT by PreThis® JOINTS with Glucosamine, Chondroitine & MSM are using state-of-the-art and extremely gentle production process, resulting in an optimal effect and availability of the joint nutrients. Since these HCAAP ISO 9001 / 9002 certified nutrients to purely natural substances that cause in the body of the dogs no side effects. The additional DOG FIT by PreThis® JOINTS is suitable both for the prophylactic protection of dogs joints, as well as for the reconstruction of an already damaged cartilage. 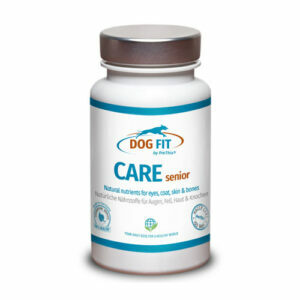 A reduction of existing joint pain can use this special dietary supplement for dogs are excellent. Order now: DOG FIT by PreThis® JOINTS is Europe’s joint nutrition no.1 for dogs! Category: Products. Tags: hund arthrose, hund chondroitin, hund gelenkschmerzen, hund glucosamin, prethis dog fit.